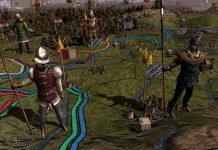 Over the years since Europa Universalis IV was first released, we have seen an absolute bucketload of updates and paid DLC that have all added more life and even more choices to this game. 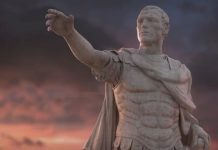 This isn’t anything new for Paradox and is all part of the company’s policy to constantly revamp its grand strategy games. 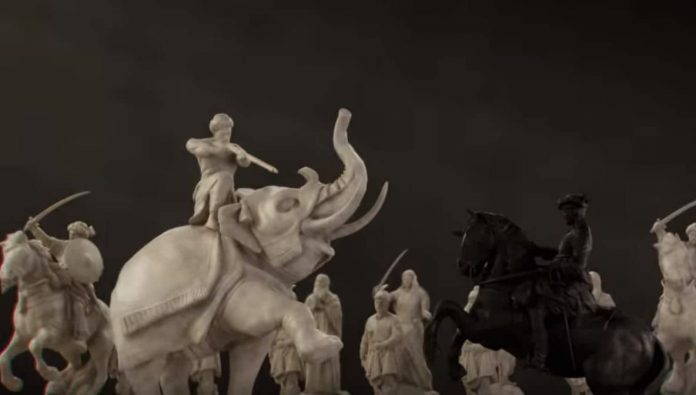 The latest DLC to be added is Dharma – but what exactly does it add, and is it part of the ‘essential’ DLC for Europa Universalis IV? 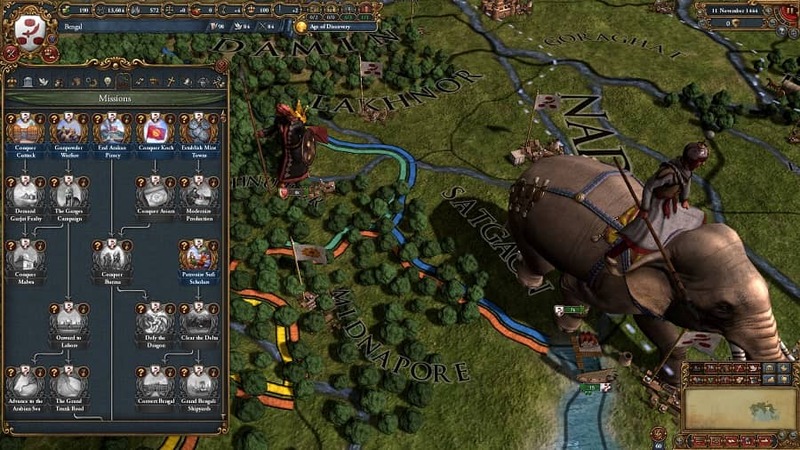 Those new to Europa Universalis IV may not be fully aware of the game’s massive scope. The game tries to encapsulate the huge revolution of feudal monarchies to the establishment of the modern nation state. It attempts to mirror this age of wonder, discovery and invention by giving every culture, area and nation a lot of choice and flavour. For example, many players will exchange the military and administrative costs of local expansion to focus on the diplomatic effort of creating trade-focused nation and vice-versa. The colonisation of the new world, the establishment of trade provinces and growing trade power all combine to make players rich and powerful. Dharma focuses on the Indian subcontinent – the home of Bollywood, the plough and pioneers of modern cricket. It is actually quite surprising that this hugely significant area of the world hasn’t had much love from the game in the past. India is filled with so many unique and interesting cultures and religions, as well being a hugely important trading location. 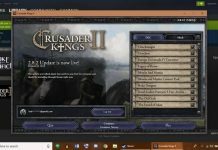 The latest expansion to Europa Universalis IV tries to emulate this in a manner of different ways, each to various degrees of success. Firstly, there are some considerable changes to the way that you interact with trade. Trade companies (that you will need the Wealth of Nations expansion for) require a bit more TLC, but for greater benefit. Trade companies are there for one thing: money. They achieve this through having a permanent influence in some of the most lucrative trading nodes in the world, like Bengal. Originally it was only possible to achieve this through invading countries and forcing the natives under your control before setting up these companies. But now you are able to charter provinces from these nations into your trading companies. Essentially, you’re buying provinces as trading outposts. As Britain, I was able to charter my way into parts of Bengal and use this as a stepping stone into the rest of India. However, I found that due to my focus on trade, a smaller presence was all that was needed to set up my trading empire. My trade-steering abilities far outweighed the locals’, and I could conquer their trade without taking their land. 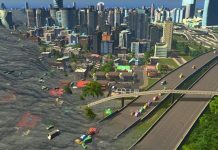 This was made possible through the new improvements you can build for your trading companies. I was able to build a harbour and improve my local trade power far beyond those around me. In Dharma, here are more benefits for building a trade-focused nation without needing to conquer all those you meet. However, probably the biggest change to Europa Universalis IV: Dharma has nothing to do with trade. It’s actually the new government reforms that you can make. Before Dharma, types of governments were relatively standardised with hardly any differences between basic feudal monarchies, tribal nations and so on and son. 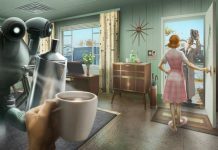 But now, Dharma has introduced government reforms that allow you to adjust your government style as you progress through the game. This is achieved quicker when you have lower autonomy, meaning the more you invest in administration the more bonuses you will have from having a more unified nation. I really like this idea and like the flavour it adds to the governing systems. If you do change your governing structure, you will get different options to choose from. Estates have had a minor tweak, too, but since estates no longer seem to demand provinces, I’ve hardly touched them. I guess this somewhat of an improvement as I hated this system, and so only having to use it when I want to is pretty refreshing. I also think the combination of the special estate types unique to India is very representative of the area. The caste system is so important to the social history of the region, so it would be missed if it wasn’t mentioned at all in Dharma. The estates system was a perfect place to show this part of the fibre of India and I am glad that they included it – though it still didn’t draw me into using this mechanic where I could avoid it. 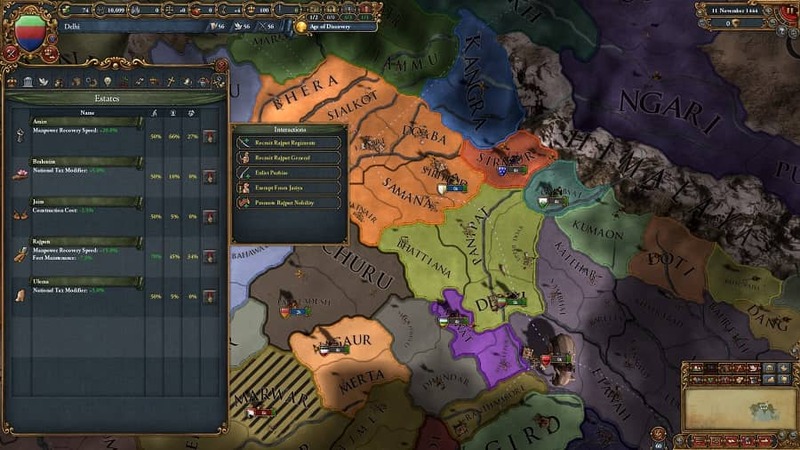 Europa Universalis IV: Dharma has also added the ability to suppress rebels with an army. As you’d expect this will have less effect the further you stretch your forces but it is still very handy. I found myself using this a lot in my Mughals campaign as I would capture whole states at a time and would need to suppress the unlucky lot I had conquered. Instead of raising the autonomy of the provinces and losing out on the income they bring, I was able to quickly set up an army on a mission to suppress the local area. This meant no more micromanagement or penalties if you didn’t want to get knee deep in sorting unrest. You can now also send colonists to fully established provinces in order to boost their development. This, understandably, reduces in effectiveness for provinces with a higher development, but it still has some uses. I can’t see this feature being used that regularly until the late game – those who are colonising will be involved in the vicious land grab and will be looking at playing wide rather than tall. However, I can imagine myself using this on the occasion that I do need to establish a powerful foothold in an area I have little land in. Dharma also brings an updated policies interface on the decisions map. The simpler layout makes it easier to understand and much more accessible. It’s a feature I’ve never used before, but since the update I have thoroughly researched which ideas and which government reforms lead to certain policies. It certainly comes in handy. I am thinking of diplomatic policies that may help the would-be emperor of the Holy Roman Emperor. And of course, the Dharma DLC adds some brand new policies, maybe giving you another reason to get the newest DLC. However, the reason you should get the new Dharma expansion is not because of these policies or the minor tweaks it introduces to Europa Universalis IV. Rather, because it transforms the subcontinent of India into a much more interesting region. With the specific caste systems and the trading overhaul, the area is much more alive for those who play as natives or those who play as foreign trade empires. 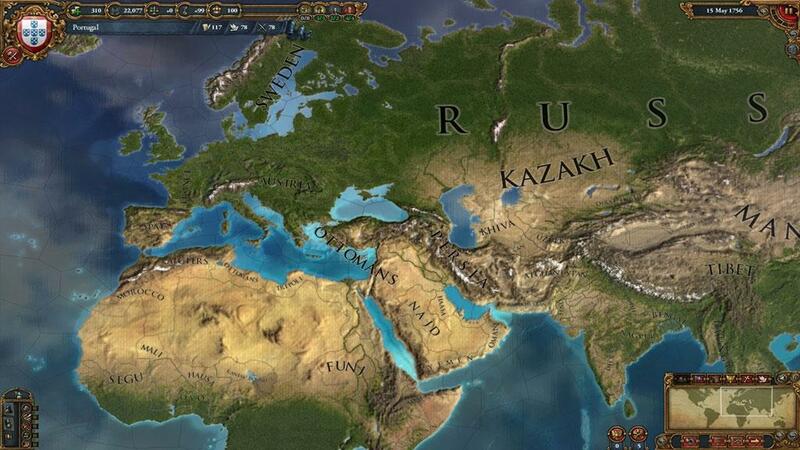 If you don’t focus on this region in your gameplay, then Dharma isn’t entirely essential, but if you’re looking to expand your horizons within Europa Universalis IV, then the £15.49 DLC may be worth a look. Europa Universalis IV: Dharma is available on PC.